This report provides detailed analysis of the different types of cosmetic products. 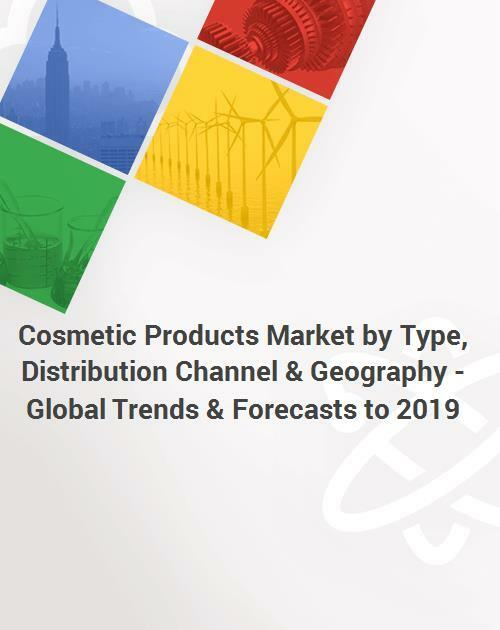 The cosmetic products segment includes market size as per the type of cosmetics, distribution channels, and geography. The cosmetic products market by types has been further sub-segmented on the basis of geography. This includes regions such as North America, Europe, Asia-Pacific, and Rest of the World (ROW). The market is further segmented on the basis of the key countries in each region. The market was segmented even further as per the important distribution channels of cosmetic products. In 2013, the cosmetic products market was dominated by skin-care products with whitening creams, anti-wrinkle creams, and others being the most widely used by consumers. This report further provides analysis of the leading players, with a clear insight and analysis of the development strategies preferred by the market players. The key players such as The Estée Lauder Companies, Inc. (U.S.), the L'Oreal Group (France), Avon Products, Inc. (U.S.), and others have been profiled in this report. It was observed that the key market players preferred new product launches and expansion as their development strategies. The cosmetic products market value is projected to grow at a CAGR of 6.3% from 2012 to 2019 to reach $ 635.7 billion. In 2013, the market was dominated by Europe, owing to innovations in new color cosmetics, skin-specific treatments, and development of unique formulas for cosmetic products. Skin-care was the largest cosmetic products in Europe, driven by growing demand for multi-feature products, such as moisturizers with sun protection or anti-aging properties. 11.7 Procter & Gamble Co.
11.11 The Estée Lauder Companies Inc.
& Recent Developments Might Not Be Captured In Case Of Unlisted Companies. - The Estée Lauder Companies Inc.